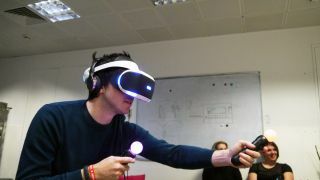 We had another VR 'a-ha' moment when trying the latest iteration of Sony's Project Morpheus - more specifically, when we got to experience London Studio's new demo, The London Heist. Morpheus has come a long way since its inception - you might have heard how it began life as a few tracking devices taped to a bicycle helmet - but the headset you see today has inherited a lot more than that. Speaking to TechRadar, London Studio Director Dave Raynard highlighted the "technology thread" that has run through Sony's ambitions to take gaming beyond the controller. "In London Studio we made EyeToy, 11 years ago, and we started developing that 13 years ago," he said. "That was really the first kind of motion gaming. There's a whole technology thread through that, and then Move gave us the tracking, some of which has then gone into the DualShock 4. We also did Wonderbook, and there's a lot of tracking in that, the same sort of tracking you get on the headset." "From my perspective it's like the stars have aligned for all these different technologies," he added. "And not just inside Sony - screen technologies through mobiles and drivers of that have hugely improved." If all goes to plan, Morpheus will launch for public consumption in the first half of next year ("It's almost there," said London Studio Creative Director George Andreas), but expect new experiences, not just a bunch of ports. Further, Sony wants Morpheus to adapt to your living room rather than the other way around. You can bend down, you can stand up, you can turn 360 degrees on the spot, "but to get someone to move around a much bigger space, practically its not the easiest thing to do," said Raynard, hinting that Morpheus might not use up as much of its surrounding area as Valve's HTC Vive. "Morpheus will effectively be in the living room so we're building around that space." "As a Studio we've made things like Eye Toy, Wonderbook, SingStar, so we've dealt with those sorts of things in the past. We've always designed for the living room. Like, you've got a coffee table here - you might move that out the way - but we're not going to ask people to move all the furniture. So we'll design from that perspective." "When we did Wonderbook, there were things where the book moves away from the camera. We can build systems that gently guide the player back."